PPAM: Pleated Pneumatic Artificial Muscle. MACCEPA: The Mechanically Adjustable Compliance and Controllable Equilibrium Position Actuator. And other designs are under study. More info here. Applications of the Variable Impedance Actuators are in tasks where the robot needs to move in physical interaction with an unknown and dynamic environment and the controlled body-actuator system must achieve abilities like safety, energy efficiency, robustness and adaptability and all our robots have VIAs as actuation technology. The goal of this project is to create a lightweight biped which is able to walk in a dynamical stable way and powered by Pleated Pneumatic Artificial Muscles. 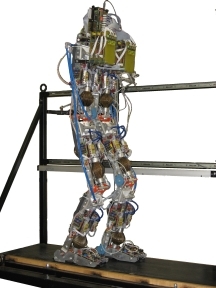 This Biped is powered by MACCEPA actuators, idea is that the stiffness of the actuators is changed so different step lengths and walking speeds are obtained. 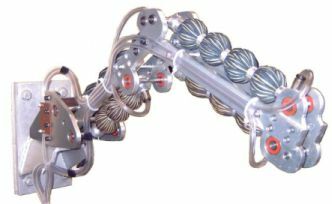 A robot arm, driven by PPAM's is developed in this project. The arm is characterized by a high payload to weight ratio and an intrinsic compliant behavior. Special controller has been implemented to also obtain safety on control level. The ALTACRO project is situated in the new and emerging field of medical rehabilitation robotics. ALTACRO stands for Automated Locomotion Training using an Actuated Compliant Robotic Orthosis. This project focuses on the design, construction and testing of a step rehabilitation robot for patients suffering from gait disorders. The key innovation in this project is the use of actuators with adaptable compliance. The first prototype is KNEXO knee exoskeleton, now a full lower limb exoskeleton is under development. ICAROs stands for Investigation into the use of Compliant Actuators in the Realization of hip-knee-foot Orthoses. The main goal of this project is to succeed in developing an actuation system that delivers sufficient assistance to the wearer in an energy-efficient way. Energy-efficiency is attained by using compliant actuators in order to mimic elastic energy storage in human muscles. The goal of this project is to create a intelligent huggy robot to study cognitive human-robot interaction and develop robot-assisted therapies, especially with children. The robot development focuses on multi-disciplinary and gathers different research disciplines e.g. mechanical engineering, speach technology, artificial intelligence, ortho-pedagogy, psychology,... Also a derived product Probogotchi has been developed to have a tangible intuitive interface to play educational games like relaxation therapies for children. 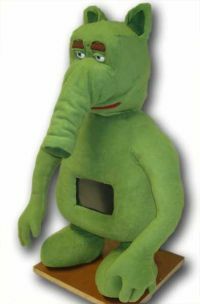 In clinical interventions, skill transfer from therapist to children with autism spectrum disorders (ASD) benefits from the inclusion of expressive artefacts such as puppets and animated characters. Well-designed robotic agents have proven to be particularly effective and are becoming an increasingly important tool for mediating between therapists and ASD children in robot-assisted therapy (RAT). However, therapeutic interventions require significant human resources over extended periods. Consequently, to make a significant difference, therapeutic robots need to have a greater degree of autonomy than current remote-controlled systems. Furthermore, they have to act on more than just the child�s directly-observable movements because emotions and intentions are even more important for selecting effective therapeutic responses. The next generation of RAT, which we refer to as robot-enhanced therapy (RET), will be able to infer the ASD children�s psychological disposition and assess their behaviour in order to select therapeutic actions. Since children require therapy tailored to individual needs RET robots will provide this too. Driven by therapists, DREAM will deliver next-generation RET, developing clinical interactive capacities for supervised autonomy therapeutic robots; robots that can operate autonomously for limited periods under the supervision of a therapist. The DREAM robot will also function as a diagnostic tool by collecting clinical data on the patient. It will operate under strict ethical rules and the DREAM project will provide policy guidelines to govern ethically-compliant deployment of supervised autonomy RET. The core of the DREAM RET robot is its cognitive model which interprets sensory data (body movement and emotion appearance cues), uses these percepts to assess the child�s behaviour by learning to map them to therapist-specified behavioural classes, and then learns to map these child behaviours to appropriate therapist-specified robot actions. 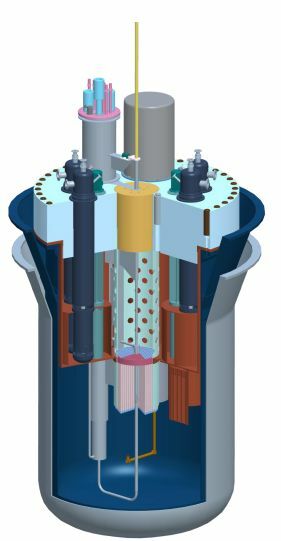 The development of remote manipulators for heavy-liquid-metal-cooled nuclear reactors and demonstration of their safety, with practical implementation in the MYRRHA research reactor. 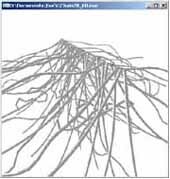 Fast dynamic simulations of mechanical systems are achieved using canonical momenta. Click on the link to view some examples.